Experience the magical energy of the New Moon while awakening your inner goddess. Join Jessica Calderon, founder of the J Way, and Antoinette Moura, founder of Clean Living Collaborators this Spring for an all-inclusive 3 day, 2 night retreat at Elohee Center in the North Georgia mountains. Elohee is a beautiful retreat center residing on 220 magical acres of undeveloped land on Bald Mountain in Sautee Nacoochee, GA (about 6 miles from Helen, GA). 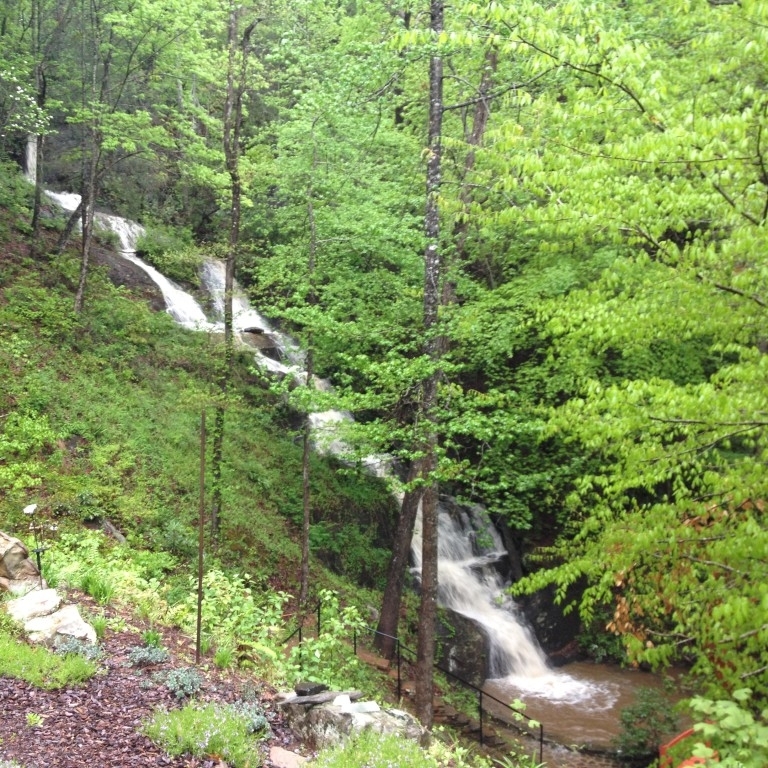 Lucky for you locals, this high vibe healing ground is only about an hour and 15 minute drive from Atlanta. Elohee Center provides the perfect sanctuary for self-reflection and renewal. During your time here you will have the opportunity to re-connect with yourself and with nature. You will enjoy endless forest vistas and panoramic views of the North Georgia mountains, a 100 ft. waterfall and wading pool, 2+ miles of well-marked trails through fern gulley’s and stream side paths (trail map provided), the “Grand Hemlock” tree (estimated to be 400 years old), a vanishing edge reflecting pond, an outdoor hot tub, a fire ring and outdoor fireplace. “Elohee ( EL-oh-HEE ) is a Cherokee word meaning “earth place.” We call the 220 acres of undeveloped land where Elohee rests Landsong. 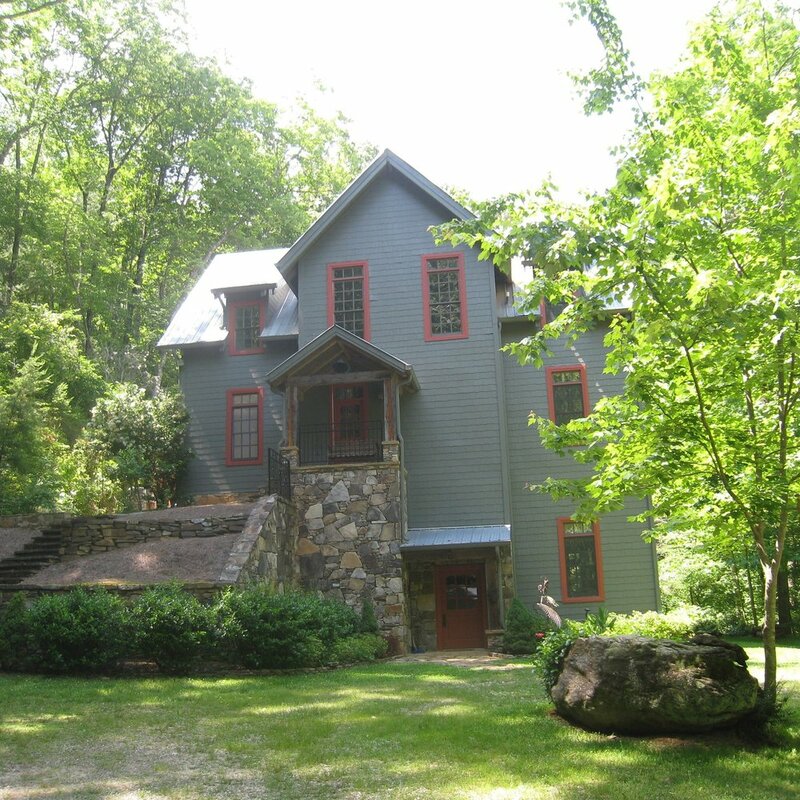 It is located in the North Georgia mountains in the foothills of the Blue Ridge near the village of Sautee Nacoochee. The Elohee Center at Landsong is being created to provide a retreat space in Nature to allow for self-exploration, individual growth, and mind/body healing. It is a place where Earth and Air, Fire and Water nurture wisdom both ancient and new.” from www.Elohee.org. During your stay with us we will live in The Thanksgiving House; a 3 story old stone cottage. It is situated next to a 100-foot waterfall and is about a 10 minute walk/gentle hike to the top of Bald Mountain. In the house, you will have free access to living and dining areas, large stone fireplace, laundry room, outside patio with fireplace within sight and sound of the 100 ft. waterfall, sleeping rooms and bathrooms, and the yoga/meditation room. We will enjoy daily yoga, sunrise/sunset meditations, hiking, a fire ceremony, fresh + organic, locally sourced whenever possible, meals prepared by a professionally trained chef (gluten-free, vegetarian and vegan options available), and more. There will be some free time in the schedule for you to refill your spirit and body in whatever way you need. This all-inclusive retreat will give you the chance to unplug and refill your spirit connection. Due to the intimate nature of this retreat it is limited to 12 people. We will arrive for dinner on Friday and leave Sunday after lunch. A more detailed schedule will be provided after you register. Triple and double occupancy rooms are shared with a significant other, friend or another single retreatant. Room placements will be made for you unless you request your roommate(s) when you register. Visit http://www.elohee.org/facilities/the-cabin/ for information and pictures of The Thanksgiving House and rooms. Check out the accommodations here! Jessica is a Shaman, Reiki Master, Yoga and Meditation Teacher working to bring awareness, balance, healing + connection to our body, mind and soul. She began her awakened journey about 10 years ago when she fell in love with yoga. Her yoga experience helped create a pathway to awareness of her body and mind. This journey eventually lead her deeper into a spiritual and energetic healing through Reiki and Shaman work. Jessica is always a student of life and enjoys deepening her experiences, knowledge and practices so that she can create an opportunity for others to do the same. Jessica has been sharing her knowledge of the moon through rituals, coaching and yoga classes while exploring the moon’s magic through the physical, emotional, mental and energetic bodies. During these retreats, you will learn and experience techniques and methods of clearing, intention setting, meditations, yoga and much more to enable the unveiling of your own magical heart. When she isn’t gazing at the moon or working her magic Jessica enjoys reading, moving her asana, being in nature, hiking and exploring with her dog shanti.